The interior of this 671,831-acre trail site, with its freshwater swamp and wet prairie, is inaccessible without an airboat or tracked vehicle. A drivable levee system on its northern boundary (see Holey Land and Rotenberger WMAs), recreational areas along I-75 across its middle, and boat ramps along US 41 in the south offer glimpses into this huge ecosystem. 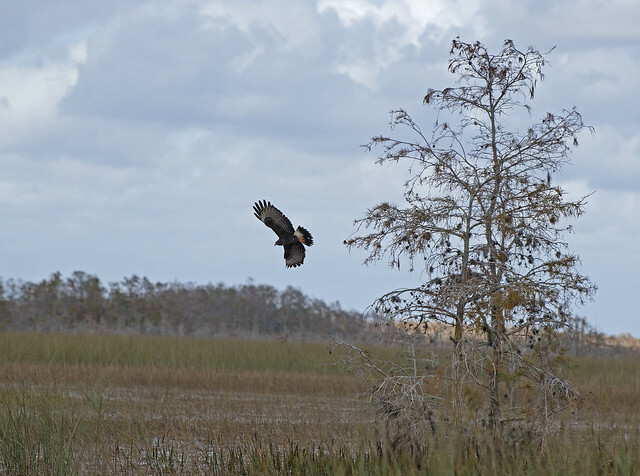 True Everglades at its best, the views from the recreational areas include egrets, herons and most other wading birds, plus clouds of swallows and occasional sightings of Bald Eagles and Swallow-tailed Kites. Snail Kites are sometimes seen at the boat ramps along US 41. On I-75, the most developed recreational area at mile marker 35 has interpretive displays of the Everglades ecosystem, picnic facilities and restrooms along with an observation tower. Seasonal hunting takes place at this site. Please click here for more details.